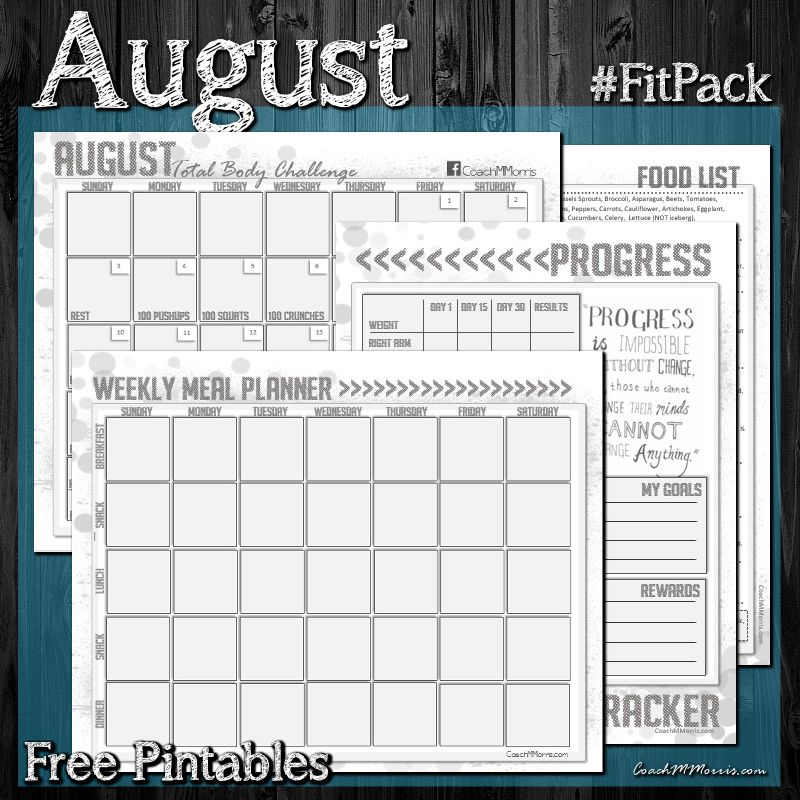 August #FitPack <--- ALL new!! OH YEAH, the FIT packs are FINALLY here! If you can't tell by now I LOVE what I do... no REALLY, I am in LOVE with every minute of my life these days and a BIG part of that is planners & planning. Success doesn't just happen... you plan for it, work towards it, track it, and SET goals to reach it. My goal as a coach is to give my team tools to succeed, and I wanted to bring that to my blog <--- So here is where these fit packs come in. You don't need a program you just have to COMMIT! So what does this pack include?? 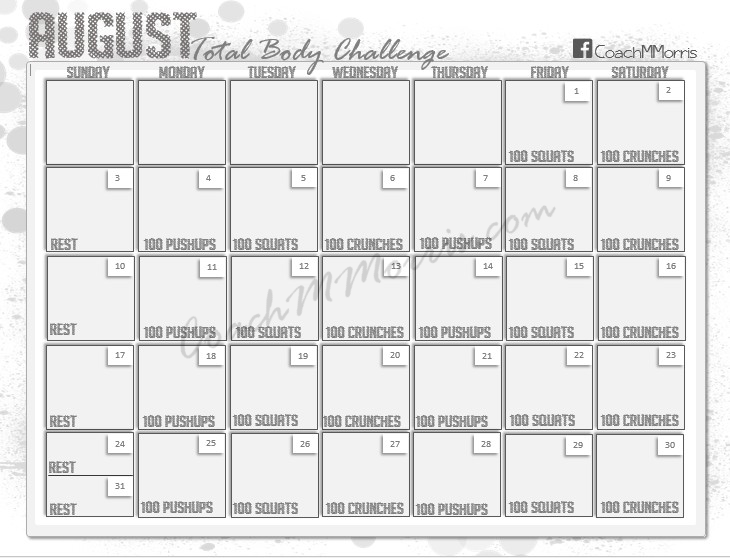 Calendar with CHALLENGE- This month (August) is a TOTAL body workout and I will warn you, it's tough!! YOU can break down the workout through the day though and do 4 sets of 25, and feel free to ROCK variations (I will be posting some CRUNCH ideas on my page tomorrow!). You can do the challenge, write in your own workout, or do BOTH... it's totally up to you! 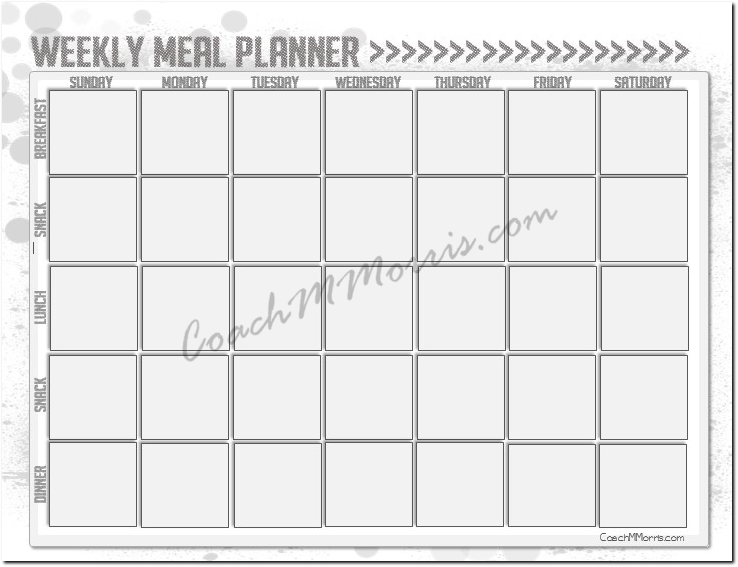 Weekly MEAL planner- You can use this to plan your WEEKLY meals <---Remember Nutrition is 80% of the battle!! 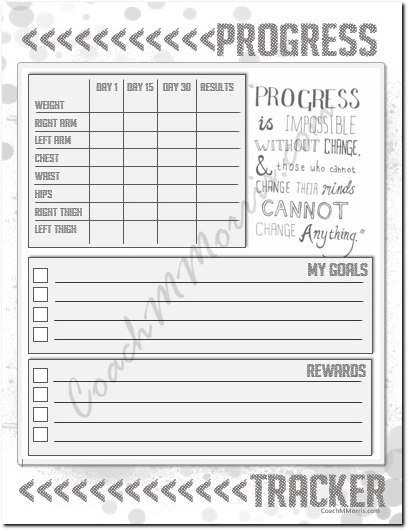 Monthly Progress & GOAL tracker- The scale isn't always your friend so BE sure to take measurements! Inches count just as much as pounds!! Don't forget to SET some GOALS... but be realistic, your not going to lose 50 pounds in 30 days. Set short term attainable goals and reward your self. One goal could be to eat clean 90% of the month and the reward could be a manicure<--- What ever you decide don't make food a reward! 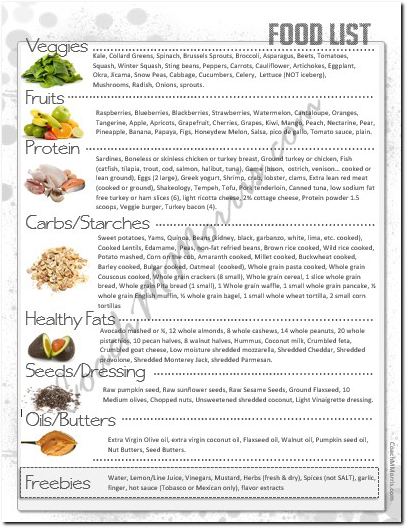 Bonus FOOD list: This is by no means a definitive LIST, but it's a GREAT place to start and it's based on the 21 day FIX meal plan which I am in LOVE with! 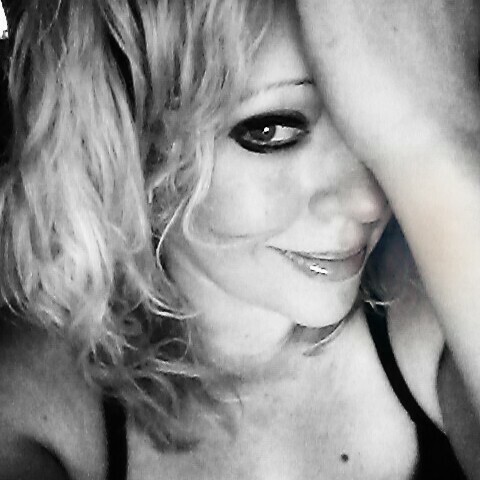 <---Stay tuned for my NEW and improved mini meal plans later this week... I may even be including a downloadable template!! This pack is like the starter pack, the bones of the whole operation. Each month there will be a new fitness calendar and Progress/goal tracker in ADDITION to the meal planner, clean FOOD list and anything else I throw in there!! I will say I am tossing around some fun IDEAS for September!! REMEMBER, these images are low quality screen shots. The downloads are HIGH quality PDF's! If you need want EXTRA accountability check in on my page daily using the tag #fitPACKchallenge in your post! Let's make this FUN!!! As always contact me if you are looking for a FREE coach, I have an EXCLUSIVE Facebook group for my team where are share all my planning tools & guides.